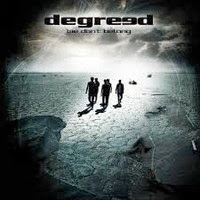 RockUnitedReviews: DEGREED: "We Don't Belong"
The Swedes of Degreed proclaim - We Don't Belong - or rather they don't belong. They certainly do not fit any particular category as they combine Melodic Rock and soft Progressive stuff with contemporary and modern pop metal. I guess you can call it Soft Rock? The key ingredient is however melodic melodies with layers of keyboards and their overall sound, at times similar to Platitude, Erik Grönwall (the solo album) and bland Swedish radio P3 music. The best thing about their second release - no doubt the smashing keyboards throughout the album. I know you're supposed to enjoy this a lot since several people on the web told you so. Then again, the same reviewers praise all the bands and end up raving about everything they review. Why bother typing about music in the first place? Simply put up a sign that reads - They're All Great - and be done with it. I'm a fan of music - not musicians. "We Don't Belong" it's just too sterile, redundant and boring. I expected a lot more considering the decent debut. 'Black Cat' is the nice opener with cool guitar/keyboard work and biting pre-chorus. No, wait, that's the actual refrain? "In For The Ride" is however one great tune from start to end and 'Access Denied' is the high energy power pop tune. The rest are just too similar in structure and style and merely the keyboards are keeping them together. 'Could it be that love is just a four letter line', quote taken from the title track off the album. Could it be that Degreed is just a seven letter word? Could it be that we don't belong?